Welcome to the 286th edition of the Rantings of the Guild Stalker, your one stop spot to get all the juiciest tidbits. But if you hear it here, you probably didn't hear it first-unless you did-in which case I call Shaman Iguana! This week we see the return of the Darkmoon Faire, so if you need to up those professions, or want that 10% reputation or experience buff don't forget to head out there--or you know if you just like getting shot out of the cannon. The Darkmoon Faire did also add a new mount this expansion, which if you weren't paying attention (like I sometimes don't) you may have missed it. It is the Darkmoon Dirigible but it is pricey (1000 Darkmoon Prize Tickets)so you will need to stock up on those tickets. The monthly quest items can be a quick and easy way to get tickets if you don't want to slog through dailies. It is also the Legion Dungeon Event again this week! What does that mean? It means with a little bit of work and some fun times with guildies (or not) you can earn yourself a chance at heroic gear. All you have to do is 1)Pick up the Quest in Dalaran 2)Complete 4 Mythic level dungeons 3)Turn Quest in 4)Profit**. **Please note that this is not a binding contract and we can not guarantee that the loot item will be an upgrade and will not be held accountable for any cursing, shouting, thrown items etc. In other news, for people as crazy and obsessive as say--I dunno, Baalance, Blizzard has announced they plan to turn on the Mage Tower permanently (soon) to allow players to work on the artifact appearance challenges until BfA is released. Perhaps more exciting for some of us is the current micro-holiday that started today: The Thousand Boat Bash! It only lasts for a few days so be sure to check is out. There is even a work around to get the Toy: Crate of Bobbers: Tugboat if you don't have it already. To learn more read Wowhead's Guide. 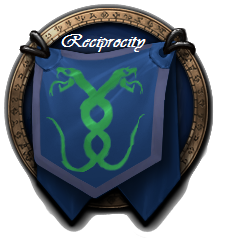 Shall we see what has transpired in the guild this week? Newp...Rho still hasn't managed it (hopefully this next week). If you have a toon that is not the correct rank or you know you are due a promotion and it is driving you nuts send Rho a mail and she will fix it. Otherwise "very soon" Rho will deal with the incorrect ranks issue and again super duper sorry sauce. If you missed last week's explanation as to why, read it again here: Unfortunately Evon's computer took a nap (hence why she has been MIA) so they haven't been getting done, but I will work on correcting things and keep you updated. Once I "fix" things if I missed them please let me know. Also, if you notice that you have alts that don't have your main's name in the comments please let me know. How do you get promoted? Guild promotions are based on your join date. In order to claim your rank there are two requirements: 1)You must claim your characters by signing up on the guild website and 2) Have an authenticator attached to your account. For more information, please click here. Balance was nominated for keeping in touch with a guildie who isn't currently able to play a bunch. They said it really made them feel special and still feel a part of this guild. Thanks Balance for keeping people in our thoughts and making them feel special. And everyone else remember you always are a part of us here even when you're not able to log on--we really do think of you often and miss you when you're not here. No One has been sending me these either, now maybe it was because there was no newsletter being published, or maybe you don't like gold. But, with that Bronty mount on the horizon, who wouldn't like a little extra cha-ching? Ya know you do...so when you complete a dungeon that nets us guild gold send rho a mail and it will enter you a chance to win gold at the end of each week! As we wrap up the expansion we don't want to overstock the guild bank, but we are going to continue to need raiding supplies, so if people have food, potion, and enchant materials please donate. If you want to get entered into the monthly drawings for big loot prizes send your donations to Dancingbee, if ye care not at all about fun and prizes drop stuff straight into the guild bank. Things we typically could always use more of: all flowers (especially starlight rose & dreamleaf), leyblood, gamy ribs, runescale koi, highmountain salmon, barracuda, stormray, and bacon. What a crazy week that was! We got our first foray into Heroic Argus--and boy was that different and a blast! Boy OY! Cindddeeee what a week to break your wrist!! She is doing better and should *fingers crossed and all the good juju* be in a smaller cast with moveable fingers in a week or so. It has been slow progress, but it has been progress. By the very end of raid last night we were consistently getting to phase three. In preparation for our upcoming raids, be sure you doublecheck your gems and enchants and let us know if you need anything. Go back over videos and class specific suggestion guides. Tweak that dps and healing/tanking rotations/UIs whatever you need. And, if you need help for any of that don't hesitate to ask. Lastly, don't forget to sign up on the calendar please even if it is that morning that you know you can come (or send rho a message in game, on facebook or a text) it really helps to know how many people we are going to have at raid time. Oh yeah, and...remember that as we get to the end we will do better, be stronger and more successful the more consistent we can be as a team (real life permitting of course) so do the best you can to show up. Lastly lastly, as we look toward the new expansion we are going to have to start (soon--not today, but soon--think in a newsletter or two) about what mains people are expecting to play next expansion. So start mulling it over and keep an eye out for my post.